Hyperion. Hardcover. POOR. Noticeably used book. Heavy wear to cover. Pages contain marginal notes, underlining, and or highlighting. Possible ex library copy, with all the markings/stickers of that library. Accessories such as CD, codes, toys, and dust jackets may not be included. Hyperion Books for Children, 2000. Hardcover. Acceptable. Disclaimer:A readable copy. All pages are intact, and the cover is intact. Pages can include considerable notes-in pen or highlighter-but the notes cannot obscure the text. An ex-library book and may have standard library stamps and/or stickers. At ThriftBooks, our motto is: Read More, Spend Less.Dust jacket quality is not guaranteed. Hyperion Books for Children, 2000. Hardcover. Very Good. Disclaimer:A copy that has been read, but remains in excellent condition. Pages are intact and are not marred by notes or highlighting, but may contain a neat previous owner name. The spine remains undamaged. At ThriftBooks, our motto is: Read More, Spend Less.Dust jacket quality is not guaranteed. Hyperion Books for Children, 2000. Hardcover. Good. Disclaimer:A copy that has been read, but remains in clean condition. All pages are intact, and the cover is intact. The spine may show signs of wear. Pages can include limited notes and highlighting, and the copy can include previous owner inscriptions. An ex-library book and may have standard library stamps and/or stickers. At ThriftBooks, our motto is: Read More, Spend Less.Dust jacket quality is not guaranteed. Hyperion Books for Children, 2000. Hardcover. Good. Disclaimer:A copy that has been read, but remains in clean condition. All pages are intact, and the cover is intact. The spine may show signs of wear. Pages can include limited notes and highlighting, and the copy can include previous owner inscriptions. The dust jacket is missing. At ThriftBooks, our motto is: Read More, Spend Less. Hyperion Books for Children, 2000. Hardcover. Very Good. Disclaimer:A copy that has been read, but remains in excellent condition. Pages are intact and are not marred by notes or highlighting, but may contain a neat previous owner name. The spine remains undamaged. An ex-library book and may have standard library stamps and/or stickers. At ThriftBooks, our motto is: Read More, Spend Less.Dust jacket quality is not guaranteed. Hyperion Books for Children, 2000. Hardcover. Acceptable. Disclaimer:A readable copy. All pages are intact, and the cover is intact. Pages can include considerable notes-in pen or highlighter-but the notes cannot obscure the text. At ThriftBooks, our motto is: Read More, Spend Less.Dust jacket quality is not guaranteed. Hyperion Books for Children, 2000. Hardcover. Good. Disclaimer:A copy that has been read, but remains in clean condition. All pages are intact, and the cover is intact. The spine may show signs of wear. Pages can include limited notes and highlighting, and the copy can include previous owner inscriptions. At ThriftBooks, our motto is: Read More, Spend Less.Dust jacket quality is not guaranteed. Hyperion. Used - Good. Former Library book. Shows some signs of wear, and may have some markings on the inside. Hyperion, 12/10/2001. Hardcover. Used; Good. **WE SHIP WITHIN 24 HRS FROM LONDON, UK, 98% OF OUR ORDERS ARE RECEIVED WITHIN 7-10 DAYS. We believe you will be completely satisfied with our quick and reliable service. All orders are dispatched as swiftly as possible! Buy with confidence! Hyperion. Hardcover. 0786806087 SIGNED COPY - Personal dedication with author's signature and a drawing on half-title page; Minor shelf-wear. ~ We Ship within 24 Hours + FREE Tracking, answer emails fast, accept returns & work hard to deliver 100% customer satisfaction! . Fine. NY: HYPERION, 2000. 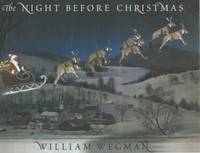 FIRST PRINTING FULL NUMBER LINE BEAUTIFULLY ILLUSTRATED WITH MR. WEGMANS WEIMARANERS A RARE FIRST PRINTING PREVIOUS OWNERS INSCRIPTION OTHERWISE FLAWLESS JACKET IS BRIGHT WITH A SMALL CURL AT TOP OF FRONT PRICE CLIPPED. STATED FIRST.. HARD COVER. NEAR FINE/NEAR FINE. Illus. 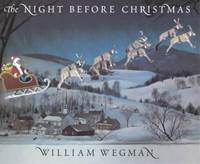 by WEGMAN WILLIAM. 2000-04-06. Good. Ships with Tracking Number! INTERNATIONAL WORLDWIDE Shipping available. May not contain Access Codes or Supplements. May be ex-library. Shipping & Handling by region. Buy with confidence, excellent customer service! Hyperion. Hardcover. 0786806087 Like New Condition. . Fine. Hyperion. Hardcover. 0786806087 New Condition. . New.